Episode 643 : Shaking Heaven and Earth! Admiral Fujitora's Power! Episode 644 : A Blow of Anger! A Giant vs. Lucy! Episode 645 : Destruction Cannon Blasts! Lucy in Trouble! Episode 646 : The Legendary Pirate! Don Chinjao! Episode 647 : Light and Shadow! Darkness behind Dressrosa! Episode 648 : Making a Sortie! The Legendary Hero Usoland! Episode 649 : The Fierce Battle Coming to the End! Lucy vs. Chinjao! 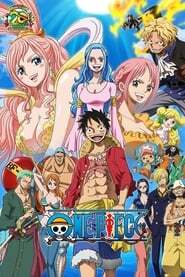 Episode 650 : Luffy and the Gladiator of Fate - Rebecca! Episode 651 : Protect You to the End! Rebecca and the Toy Soldier! Episode 652 : The Last - and Bloodiest - Block! Block D Battle Begins! Episode 653 : A Decisive Battle! Giolla vs. the Straw Hats! Episode 654 : Beautiful Sword! Cavendish of the White Horse! Episode 657 : The Most Violent Fighter! Logan vs. Rebecca! Episode 658 : A Big Surprise! A True Identity of the Toy Soldier! Episode 659 : A Horrible Past! The Secret of Dressrosa! Episode 660 : A Nightmare! The Tragic Night of Dressrosa! Episode 662 : Two Great Rivals Meet Each Other! Straw Hat and Heavenly Demon! Episode 663 : Luffy Astonished! The Man Who Inherits Ace's Will! Episode 664 : Operation SOP Starts! Usoland Charges Forth! Episode 665 : A Burning Passion! Rebecca vs. Suleiman! Episode 666 : The End of the Match?! A Surprising Result of Block D! Episode 667 : The Admiral's Decision! Fujitora vs. Doflamingo! Episode 668 : The Final Round Starts! Diamante The Hero Shows Up! Episode 669 : A Moving Castle! The Top Executive Pica Rises up! Episode 670 : Dragon Claw Strikes! Lucy's Intimidating Attack! Episode 671 : Defeat Sugar! The Army of the Little People Charges! Episode 672 : The Last Light of Hope! The Secret of Our Commander! Episode 673 : The Rupture Human! Gladius Blows Up Big Time! Episode 674 : A Liar! Usoland on the Run! Episode 675 : A Fateful Encounter! Kyros and King Riku! Episode 676 : Operation Failed! Usoland the Hero Dies!? Episode 677 : The Legend is Back! Kyros' All-Out Attack! Episode 678 : The Fire Fist Strikes! The Flare-Flare Fruit Power Returns! Episode 679 : Dashing onto the Scene! The Chief f Staff of the Revolutionary Army - Sabo! Episode 680 : The Devil's Trap! A Dressrosa Extermination Plan! Episode 681 : The 500 Million Berry Man! Target: Usoland! Episode 682 : Breaking through Enemy Lines! Luffy and Zoro Launch the Counter-Attack! Episode 683 : With a Rumbling of the Ground! The God of Destruction - Giant Pica Descends! Episode 684 : Gathering into a Powerful Front! Luffy and a Group of Brutal Warriors! Episode 685 : Steady Progress! Luffy's Army vs. Pica! Episode 686 : A Shocking Confession! Law's Soulful Vow! Episode 687 : A Big Collision! Chief of Staff - Sabo vs. Admiral Fujitora! Episode 688 : A Desperate Situation! Luffy Gets Caught in a Trap! Episode 689 : A Great Escape! Luffy's Tide-turning Elephant Gun! Episode 690 : A United Front - Luffy's Breakthrough Towards Victory!